Tim Nicol casting on a glorious winters day at Lake Lyndon. Photo courtesy of Tim Nicol. Mid-winter view of Lake Lyndon looking north, back towards the main road which passes behind the tree line in the distance. The single road follows the entire south shore of the lake making for easy access. 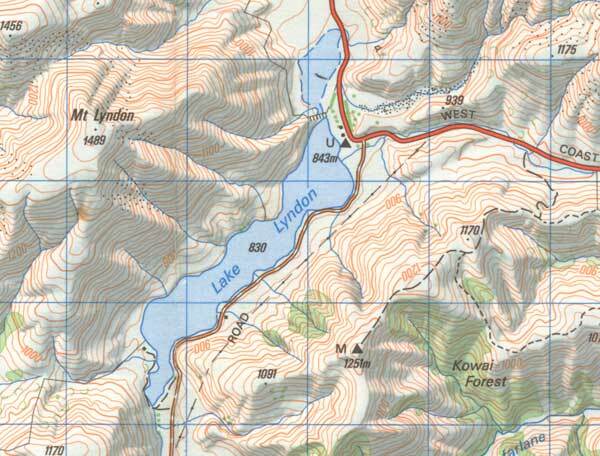 Named by Edward Jollie, Lake Lyndon nestles near the top of Porters Pass. It really is a Canterbury high country lake in the truest sense sitting in an almost tree-less barren tussock landscape. 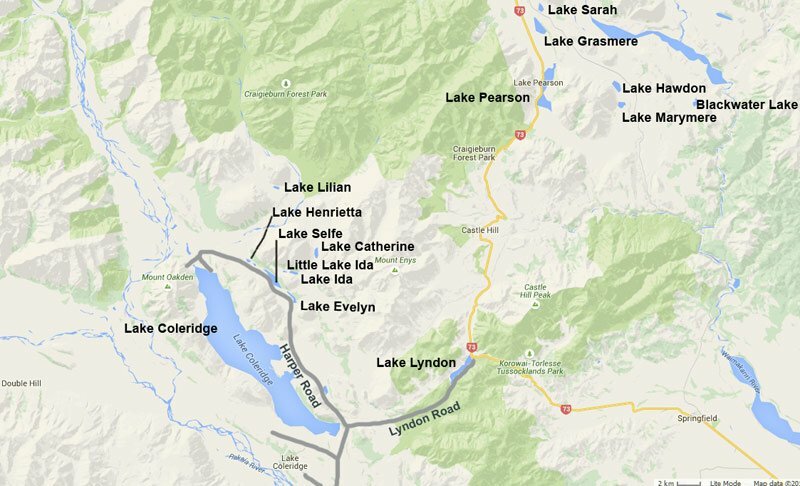 Lake Lyndon drains at its southern end into the Acheron River which in turn flows to the Rakaia River. In winter snow frequently falls to the water’s edge and at least part of the lake ices over. State Highway 73 passes the northeastern tip of Lake Lyndon between Springfield and Castle Hill Village. 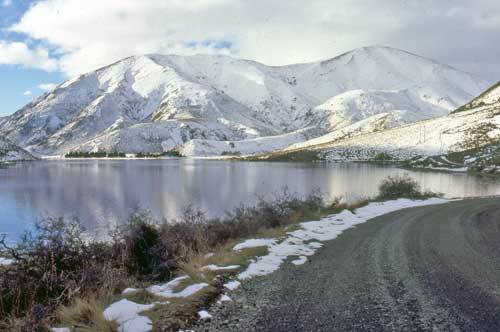 Lake Lyndon is about 90 minutes drive from Christchurch – the last part of the journey being up the steep Porters Pass. 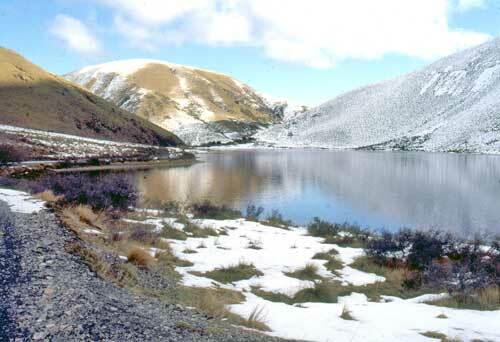 This is the first true Canterbury high country lake on the main road between Christchurch and the South Island’s West Coast. Lyndon Road runs around Lake Lyndon on the eastern side providing excellent fishing access. The dry weather shingle Lyndon Road joins with Lake Coleridge about 50 minutes drive to the west of Lake Lyndon. This road can be a bit hairy in winter. This rainbow trout took a Mepps blade spinner cast from a drifting boat on Lake Lyndon. After casting you can place your rod on the snow with your reel drag backed-off while you jump up and down to warm up! Photo courtesy of Tim Nicol. 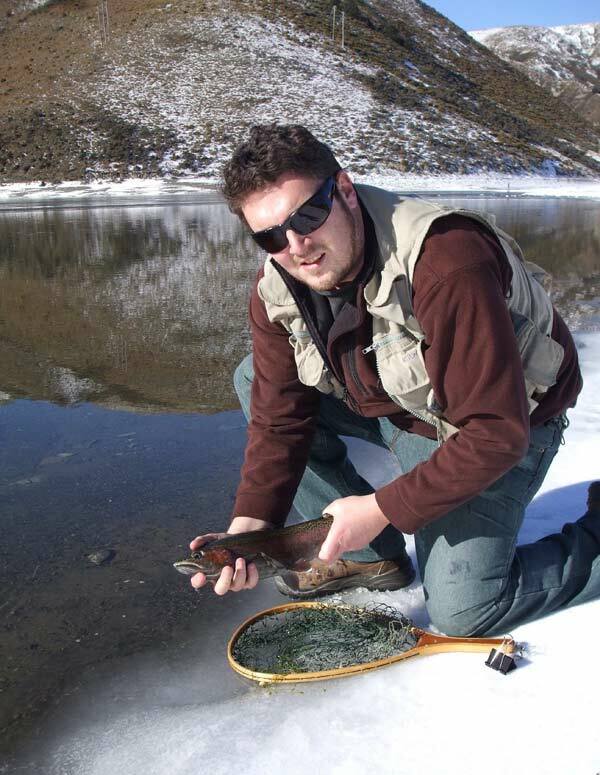 North Canterbury Fish & Game keep Lake Lyndon well stocked with rainbow trout. Fly, Spin and Bait fishing is permitted in Lake Lyndon. Open season is from the first Saturday in November to 30 April. There is also a winter extension from 1 June to 31 August. The high numbers of smaller rainbows present in Lake Lyndon make the lake an ideal destination for introducing junior anglers to trout fishing. There are no brown trout in Lake Lyndon. Lake Lyndon looking in the opposite direction from the photograph at the bottom of the page. 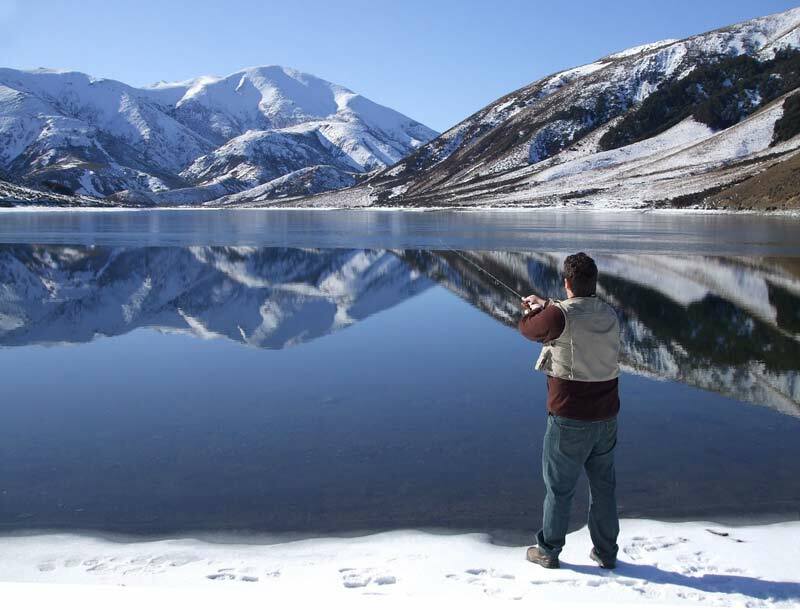 Lake Lyndon has a Winter Fishing Season that runs from 1 June through to 31 August. 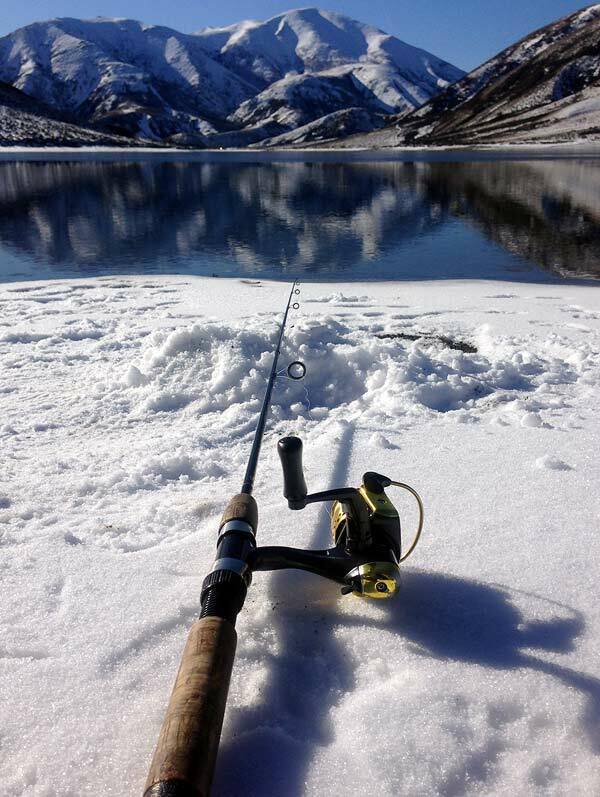 The fishing might be harder than nearby Lake Coleridge but the scenery is always a treat for the eyes. Lake Lyndon is an ideal destination for dry fly fishing in high summer. A nymph fished deep on a long leader is also productive. Lake Lyndon is quite deep and spin anglers are advised to allow their black and gold Toby to sink well down before retrieving. On several occasions, I have had great success fishing for rainbows after dark, around Lake Lyndon, with luminous doll flies. The rainbows are very obliging in taking glow-in-the-dark lures. These are well worth a try and are good fun for the kids. The best fishing for rainbow trout is usually late in the winter season as this lake tends to heat up quite a bit during summer. During the winter season, lake conditions are also more likely to be calm and free of the strong wind associated with the summer months. Parts of the lake also freeze over in winter. Tim a with a typical winter rainbow trout from Lake Lyndon taken on a Glo-bug. On light spinning gear 60cms up your main line attach enough split shots so you can cast out about 20 meters. Then at the end of your main line tie on 1 or 2 Glo-bugs (I use orange and pink). I also paint them in silicone (the stuff you use for dry flies) so they float off the bottom. Cast out with a bit of slack and wait. You can even put your rod down on the ground with drag loosened off. The idea is the Glo-bugs are suspended in the water just above the weed beds. Cruising trout come along and pick them up. Works great in the colder winter months. A glorious still mid winter’s day at Lake Lyndon. Photo courtesy of Tim Nicol. Click on the photograph to enlarge. Lake Lyndon. The Maori name for Lake Lyndon is Hapuawaikawa or simply Waikawa. Sourced from NZTopo50-BW21. Crown Copyright Reserved. Pearson and Coleridge Group Lakes. Click on the map to enlarge. Map Courtesy of Google Maps. If you found this article useful please subscribe to the Fishingmag Trout & Salmon Email Newsletter. Get free fishing ebooks, updates, and our latest article releases. Previous « Hokitika - Snapper caught on beach longline near Hokitika, West Coast, S.I.